Bruno & Boots | TV, eh? Jonny Gray has established himself as a bona fide star for YTV. He leapt onto the network as co-lead on Max & Shred and most recently became Bruno in the Bruno & Boots franchise. Now he’s utilizing his real-life horse-riding skills as Josh Luders in the channel’s newest series, Ride. But Ride, debuting its first episode of 20 half-hours this Monday on YTV, isn’t all about Gray. 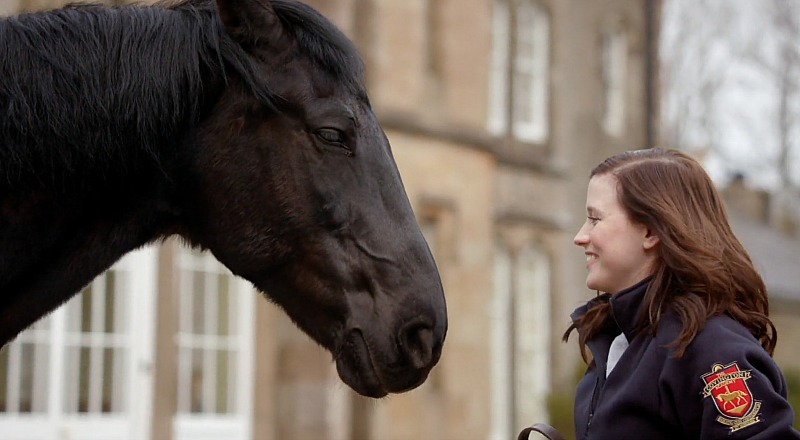 Instead, he’s part of an ensemble in the equine-themed family drama about Katherine “Kit” Bridges (Kendra Timmins, Wingin’ It), a young lady who swaps Canada for England when her father, Rudy (Mike Shara), accepts a gig as an equestrian supervisor at Covington Academy, an elite riding school. The Canada-England co-production, between Breakthrough Entertainment and Buccaneer Media in the UK, was created by writers Jill Girling (Life with Derek) and Lori Mather-Welch (Queer As Folk) and has a direct lineage to series like Heartland and Anne of Green Gables. Like Heartland, there are horses and a lot of time is spent on them. It’s a horse riding boarding school after all, so that makes sense, and the beautiful beasts are certainly celebrated. Director Stefan Scaini, a stalwart of Canadian TV from Heartland and Odd Squad to Avonlea and Wind at My Back, spends several moments capturing their movement in Monday’s debut. But Ride feels more to me like an update of Anne of Green Gables. Kit has a flowing, unruly mane of reddish hair, bursts with enthusiasm and energy, and thinks nothing but the best of people. That, of course, causes her to run afoul of uppity rider Elaine (Alana Boden) and school marm Lady Covington (Sara Botsford). Kit does make a friend rather quickly: a wild and unpredictable horse named TK everyone is afraid of. There’s a lot to like in Ride. Aside from strong writing—in the first 60 seconds of the debut we know why Kit and Rudy are in England, how they feel about it and their reservations—and the performances (Timmins, in particular, is fantastic), there’s the setting: rolling green English countryside, gnarled tree branches and moss-covered castles. Check Ride out and let me know what you think. Ride airs Monday to Thursday at 7 p.m. ET/PT on YTV. Cast image courtesy of Corus. And now Bruno & Boots: Go Jump In The Pool has been effortlessly translated to TV and I watched it all so it must be OK for adults my age to enjoy as well. Continue reading. Like many Canadians, Callan Potter grew up reading Gordon Korman’s adventures about two buddies, Bruno and Boots, their friends and the prep school they attended. Little did he know he’d end up portraying one of them. “When I heard about the audition, I was excited because it was going to be a Bruno & Boots TV-movie,” Potter says. “That was before I even auditioned for the role.” But audition he did, landing the two-season Stratford Festival performer his first-ever television gig as Melvin “Boots” O’Neal in YTV’s Bruno & Boots: Go Jump in the Pool project airing Friday, April 1, on YTV. Based on Korman’s novel of the same name, Max & Shred‘s Jonny Gray plays Boots’ best bud, Bruno Walton; the pair hatch a plan to score money to build a swimming pool for their prestigious Macdonald Hall after some parents consider moving their sons to rival institution York Academy where there is a pool. The challenge? Coming up with creative fundraising projects to get the cash under the watchful eye of Headmaster William “The Fish” Sturgeon (Peter Keleghan). What makes Bruno and Boots so appealing in the books is their chemistry. Yes, they constantly tease each other, their friends and prank everyone in sight, but they’re fiercely loyal to each other and their school. That bond is also evident on-screen between Potter and Gray, and began during their first screen test. “We hit it off right away,” Gray says. “We have so many similar interests.” Admittedly, it is a bit jarring to see fictional characters brought to life in a television series or movie. After creating an image of them in my head while reading the books, it took a few minutes to adjust, especially The Fish, who I pictured as a thin, bald man. Peter Keleghan couldn’t be further from that, but brings an energy—and physical comedy—to Go Jump in the Pool that not only will cause viewers to laugh, but his co-stars during filming as well. “I was in a scene with Peter and Scott [Thompson, who plays York Academy’s Headmaster Hartley], and I was just watching them, thinking, ‘This guy is a genius,’ and I missed my cue,” Gray admits. The physical laughs don’t just come from Keleghan, however. Gray and Potter, along with co-stars Hannah Vandenbygaart, Kiana Madeira, Joshua Kilimnik, Drew Haytaoglu and Isiah Lea, all participated in a cooking competition fundraiser that turned into a massive food fight. Bruno & Boots: Go Jump in the Pool airs Friday, April 1, at 7:30 p.m. ET/PT on YTV.